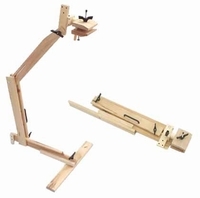 Make your needlework even more enjoyable with needlepoint workstands. A workstand provides a stitcher with a firm and comfortable place to do stitching. Needlepoint workstands are used to hold hoops and frames while you work on them. The needlepoint workstand also allows the stitcher to keep one hand on top and one hand underneath while stitching. Therefore, they do not have to continually move one hand from over to underneath the canvas. The legs will tuck under most sofas, beds and tables allowing you to use them anywhere. Some workstands are made from carpentry grade pine and are machine manufactured for accuracy and quality. When not in use, some stands will fold flat for easy storage. Oversized and heavy packages may also incur additional shipping and handling charges.